Now you run your script as usual, and it stops at the pdb.set_trace() line and opens up a Pdb prompt. Then you can go line by line, explore and set variable contents and find out the source of your problem. Great! This approach is convenient and easy to use. 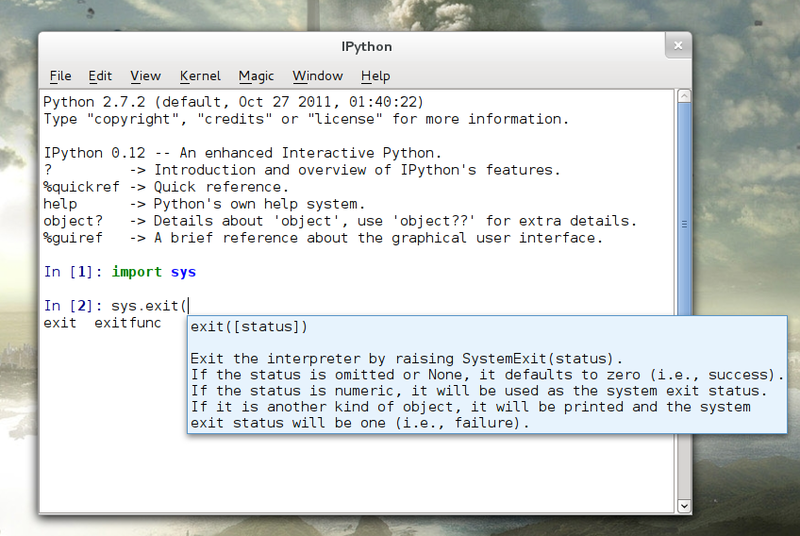 Did you know that IPython has GUI? I didn’t. Then I’ve found ipython-gui package by accident. Wow, what is this? This package contains the gui of ipython, which requires PyQt. Nice, let’s try that out. I installed ipython-gui and… nothing. No new desktop launcher installed. No new executable installed. No new man page. No documentation of any kind. Nothing. Inspecting man ipython yielded same (no) results. Hah, you are no match for me, ipython developers, I’ve found it in the end! Tab completion hints disappear nicely and don’t “reset” your current line. Methods docstrings are shown in the form of tooltips immediately after typing the opening parenthesis. True multi-line editing support. You can finally invoke a multi-line command from history and easily change a single line. Yes!